You know what I (and my favorite coworker/friend) have discovered recently? That bringing your lunch and walking the half block to Central Park is so, so much better than trying to fit a trip to an annoying Manhattan restaurant on the Upper East Side into a one hour break. Even on 90 degree days it's better. Even in the humidity, sitting in the sun is better. There are vitamins in that sun! And tan lines to develop. Rinse the quinoa in a sieve under running water. 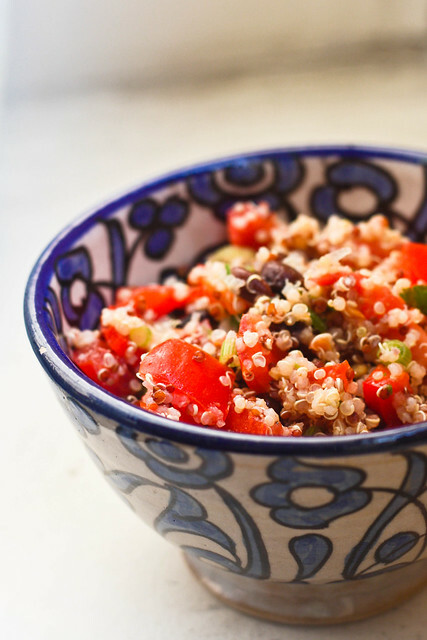 In a medium pan, bring the 2 cups of water to a boil, add the quinoa, cover, and reduce heat to low. Cook for about 15 minutes, until all the water is absorbed, but check early so it doesn't dry out and burn. Remove from the heat and let cool. UPDATE: The original recipe called for some seeded (I think) and diced chili pepper, but I skipped it, mostly because I forgot to pick one up (it happens). A reader pointed out that I mentioned it in the recipe, but not in the list of ingredients. So if you want something with a little more kick, definitely include the chili pepper! This looks great! But I think your ingredients may be missing something - the instructions mention chiles but I don't see them in the list. 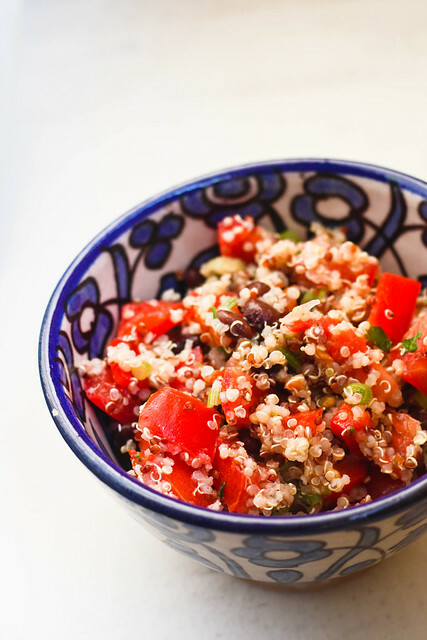 Quinoa is one of my favorite grains these days. Add in black beans and lime? This looks so perfect for summer! Thanks for the catch, cassie. I've updated the post!